Quad gets active with compact 9AS speakers with built-in DAC | What Hi-Fi? The latest addition to the Quad hi-fi range is the £600 9AS active speakers with built-in DAC (digital-to-analogue converter). The 9AS speakers feature a built-in amplifier in each unit, thus eradicating the need for an external power amp. Quad has also built a DAC into the speakers, which is able to support 24-bit/192kHz audio. Each pair comprises a 'master' and a 'slave' unit; both units feature a 100W Class AB power amplifier. The master accepts all audio inputs, as well as controlling volume levels. The slave meanwhile is fed audio data via a line-level output from the master. A subwoofer output is available to create a 2.1 set-up if you want extra bass. The drivers in the 9AS speakers comprise a Quad mid/bass unit with a 10cm woven Kevlar cone, plus a newly designed 2.5cm fabric-dome tweeter. The 9AS speakers can be placed in almost any location, thanks to a three-position bass EQ facility, which equalises low-frequency response. This means they can be free standing, placed on a shelf or even close to a wall. Quad claims no matter where they are positioned, they will "deliver crisp, clear and musically insightful results." Quad has fitted the 9AS speakers with a range of inputs. On the digital side are asynchronus USB and S/PDIF connections, all of which can receive 24-bit/192kHz audio data. For analogue sources, RCA inputs are on hand. A 3.5mm jack input is also provided for the connection of portable devices. Volume controls and input selection is handled via either a remote control, or a touch-sensitive panel found on the base of the master speaker. 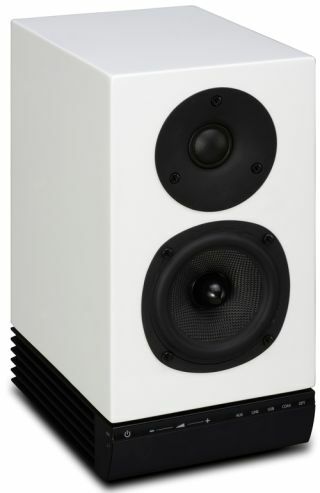 The Quad 9AS active loudspeakers are available this month for £600 per pair. Buyers can choose from high-gloss black, high-gloss white or ruby finishes.